← Joy Essential Oil-What’s in it? I’m going to do what no financial guru will do for you in this blog without charging you thousands of dollars. Why am I going to give it to you almost free? Because I want to create value in your life. If this one blog posts make a difference in your life, I will be happy. I’m going to share some investment suggestions that will make you money. (Nothing guaranteed of course). Investment #1 Your Own Residual Income Business. If you want to become rich, trading time for money is the worst way. (As in an hourly job). Going into business for yourself (even part part-time) can create residual income streams for you and your family if you get in the right business. Multi-Level Marketing is the type of business that can create residual income. This is how the rich get richer. Repeat income, coming in month after month after month, 24/7. This is how you too can *become rich also by using the power of residual income with a low investment. While a low investment financially, it does require more of your time, especially for the first 3 to 5 years to build a large team of people (no, you don’t have to find them all) and as your team reorders product for themselves and also has retail customers, you make a percentage of commission from their sales, so many levels down. No inventory (except for your own products that you and your family use along with possibly a Premium Starter Kit to show prospects in person). No employees (everybody works for themselves) little overhead (work from home or anywhere else you want), and so many other benefits. Also owning your own part-time business with the intention of making a profit can create extra tax deductions for you that you wouldn’t have as an employee. (See a tax professional for more details). To learn more about creating a lifestyle of health and riches, click here. While it’s impossible to time the market perfectly, there are indicators that happen that can create an opportunity for income investments. How would you like to get it right at least once every four years? There is a thing that happens every four years that can help you in picking stocks for growth. This thing is called “The Presidential Election.” As a general rule according to Jim Crammer’s book Mad Money when you are in an election year, depending on who will probably win the elections, you’ll want to buy or sell certain sectors. If you think the Democrats were going to retake Congress, he suggests selling the defense contractors, because they would cut defense spending for all but homeland security. Yet at the same time, it would be a good bet to buy anything that makes money from Medicare or Medicaid, because you would assume the Democrats would be more likely to increase spending there. After determining the sector, look at the individual Company’s stock to consider which one to buy with all factors weighed out. (Read his book to learn which factors to consider). Robert Kiyosaki talks about this a lot. When you own a stock that faithfully pays out dividends regularly, you make money. The more stock you own, the more dividends you get paid. You want to research on your own companies that have paid out dividends faithfully over the years or you can buy my report of the study I’ve done of solid companies that pay out dividends regularly. My report is only $19.95. (Email me and I’ll tell you how to get a copy). Since I’ve done all the work for you, it’s well worth it. It lists the company name, stock symbol, how long the company has been in business for, and on average how much dividends each company pays. Both Robert Kiyosaki and Grant Condone both say passive income is important to have. Passive income gets taxed less than earned income. Something very important to keep in mind. Passive income continues even when you don’t. You get injured, you die. Your passive income continues. (Something vital to provide for you and your family). The last thing you want is, you die and the only thing your family gets is a life insurance check. Granted, having life insurance is important if your assets are low, but that’s not the only thing you want to leave your family. 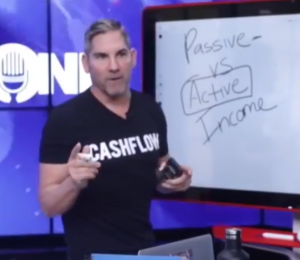 You want to leave them passive income. Your goal should be to match your active income with passive income. If you have a job or business and you’re making $100,000 a year, your goal is to have $100,000 a year in passive income. Both Grant and Robert say to invest in hard assets such as Real Estate. Even when the currency goes down, you still have your income producing Real Estate. This blog post is by far from exhaustive in the types of investments you can make. But this blog post I believe is a good start to get you on the way to creating income streams that can make you rich. This entry was posted in Rich You and tagged hard assets, income streams, investments, multi-level marketing, real estate for passive income, residual income, stocks for dividends, stocks for growth, streams of income. Bookmark the permalink.